These cute bundles of zen are perfect little gifts for friends, coworkers and stocking stuffers. Everything in them has a special meaning and can be customized for whatever you would like to wish upon your giftee, like love, abundance, happiness or a fresh start in the new year. 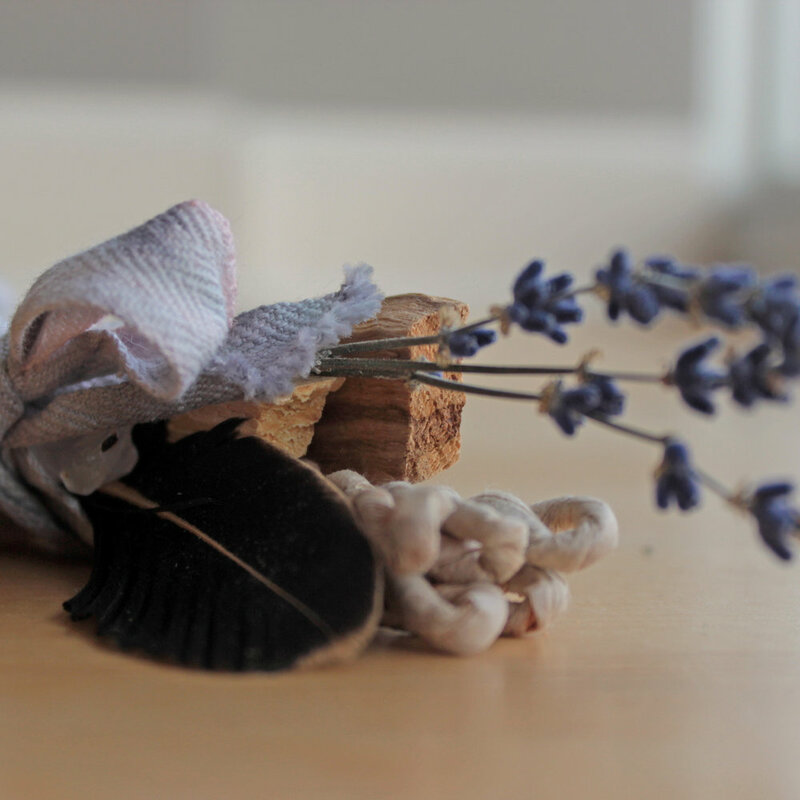 I found this cute bundle at a gorgeous shop called Asrai Garden, but you can easily make your own using a feather (for connection to the divine), a few pieces of rope (for knowledge), palo santo (for cleansing and purification), a lavender sprig (which is said to attract love, happiness and peace) and a crystal (a clear quartz is shown here, which is kind of the jack of all trades for crystals. It’s a master healer and amplifies the power of other crystals). For a festive touch, you can substitute a green stone like green aventurine or moss agate (for abundance) and a sprig of holly (for good luck)! The ultimate energy cleanser. This gift of sage and palo santo will bring the receiver protection and blessings. I made this bundle for a friend who’s moving so she can clear her new home of any old or negative energy floating around and fill it with her family’s instead. The bay leaf wards off negativity as well, and it is also said to bring good fortune and success. You can also write a wish on the bay leaf, and burn it to make it come true! And to think, I always thought it was just a pasta sauce seasoning… Tie it all up with a crystal in a wire cage for bonus blessings. Pyrite is shown here for leadership, harmony and positivity. For a festive touch, just add a hook or hanger to the crystal cage, and you’ve got yourself an ornament that is truly the gift that keeps on giving. The “wisest men” in Christmas history gave gifts of frankincense and myrrh, both aromatic resins, so why not take a page out of their book and give the gift of fragrance? 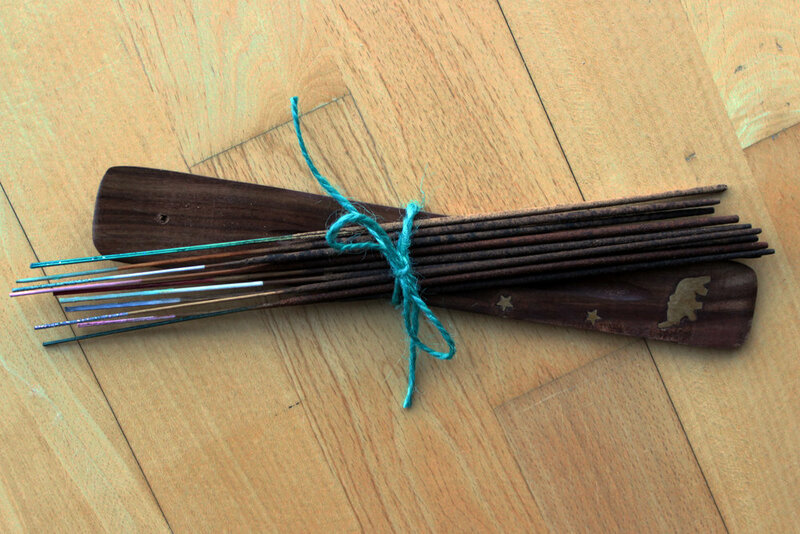 Tie incense with a cute holder and ribbon, and just relax knowing you have the best-smelling gift on the block.